“The Roadster” during a trip to Banff, Canada, in 2007. One week ago today I lost an old and very dear friend who, despite never having offered a word of appreciation or any declaration of support, ultimately saved my life. At about 9:20 a.m. on Thursday, June 23, I was driving back home after dropping my wife off at her office in downtown Seattle. As usual, I was behind the wheel of my wonderful 2002, metallic gray Saab 9-3, a sporty little vehicle that’s seen me through some nightmarish roads trips, multiple visits to my brother and other family members in Portland, Oregon, and one 781-mile round-trip vacation up north to the Canadian resort town of Banff, Alberta, in 2007. Only 11 blocks from my house, on a relatively quiet neighborhood thoroughfare, I stopped well behind a Subaru Forester that was signaling to make a left-hand turn across traffic. All of a sudden, I looked up in my rearview mirror and saw a big blue car barreling down on me from behind. Knowing that it was going to hit me, and without any time to swing out of its way, I slammed my foot down hard on the brake, hoping to stop the Saab from smashing into the car in front of us. Sure enough, I was rear-ended. Hard. The car responsible, a 1992 Oldsmobile Cutlass, was traveling at 30-plus miles an hour--and I don’t remember hearing its breaks. The Cutlass was ruined, its grill disappearing into dust and its front end buckled as far as it could go without throwing the engine into the passenger compartment. 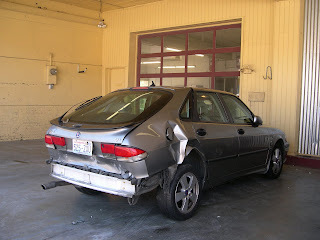 My lovely Saab, being much better made, suffered less damage, but its back end was pushed forward enough that I couldn’t drive it, without the rear bumper scraping my back tires. The 20-something woman driving that Olds Cutlass admitted to the police officer who showed up to make the accident report that she’d been looking down at her cell phone and chatting with her girlfriend in the car, and hadn’t been paying attention to her driving. She didn’t see the two vehicles stopped in her path. I wasn’t seriously injured, though I wound up with some soreness in my neck, back, and ribs. Thanks to my last-minute jamming of the brakes, I only tapped the Subaru in front of me--which was a damn good thing, because the mother behind its wheel had her baby in the back seat; neither of them was hurt, either. The Saab took the brunt of that morning’s violence. And performed heroically. 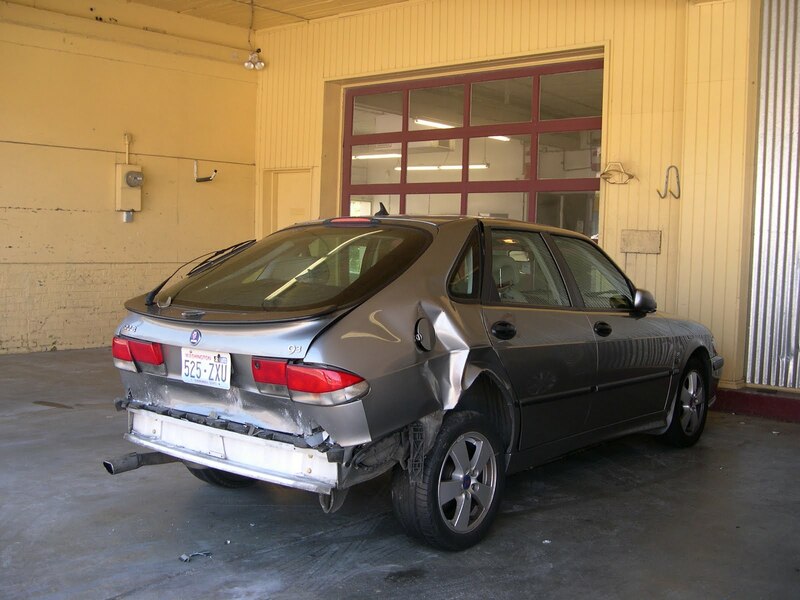 After looking over the photos from that crash, my brother, who’s spent years dealing in cars, said the Saab absorbed the blow exactly as it had been designed to do, and that if I’d been in a smaller, less sturdy automobile, I would have wound up either in a hospital ward or under a gravestone. Unfortunately, my beloved car--the one on which I’ve lavished so much care and affection over the years, and which I thought I would have for a decade to come--won’t be returning home. My insurance company has declared it totaled, estimating the cost of putting it back on the road at $12,000, more than its present market value. I’m heartbroken. I loved that car, which my wife and I had come to call, affectionately, “The Roadster.” I was proud every moment I was driving it. I’ve never found such enjoyment in a car as I did in the Saab. It gave us almost no trouble over the years, and I tried to pay it back for its reliability by keeping it in top condition. But I couldn’t stop a negligent young woman from damaging it beyond repair. Perhaps the only hopeful thing that’s come out of all this horror is that my mechanic, who has worked on the Saab ever since I bought it and knows what excellent shape it was in, purchased it from my insurance company at a good price, with the intention of dismantling it for parts to use in other older vehicles. In other words, my beautiful little car’s legacy is to help keep its fellow Saabs up and running and protecting other drivers who depend on their strength as much as I did on my car last week. Only in that respect might its sacrifice be thought worthwhile. Thank you, old friend, I won’t forget you. READ MORE: “Close Shave Indeed,” by Byron Rice (Notes from the Flatlands ...). Did she have insurance? On a related note, if I were you, now that the accident was a week ago, schlep your body to your family doctor and ask for a complete physical ... just to see how your body parts "are settling out." The first week after an accident, you have no idea how you feel. They are old friends...and I'm very glad you weren't hurt! Wow, quite a story. Glad you weren't injured! Being from Auburn, Washington, I have to ask, "She got a ticket for using the cell while driving, right?" Her insurance will go up for the at fault accident. At least you have that satisfaction. Glad your OK, and she was lucky the Subaru with the baby wasn't directly in front of her. Our state is one that has banned using a cell phone while driving, but how the heck do you enforce that kind of law? In 55 years of driving I've seen it all and never have I seen so many people driving distracted. You're a very lucky man to be alive to tell the story, even in that great car. Glad you are well and sorry about the Roadster. Over the years I've become emotionally attached to some of my cars and not at all with others. For example, I've had a couple of Hondas that were great, reliable machines; but I sold them without regret. At one point I had a Renaut LeCar (fool that I was). It was horrible. I had to replace parts right and left. Three radiators, a couple of wheels (not tires); but I still miss it. Again, glad you are safe. Funny how you feel emotional over a car but when it's saved your life you do. Happened to me when a nutter of a taxi driver did a U turn across me & smashed into my old VW Golf. I was OK emotionally after the accident until I went to collect my stuff out of the and I saw the state it was in. When the bloke at the garage said that it had done its job & saved my life I was no use! Thankfully you were all OK. It's illegal in the UK to use mobile phones when driving but you see it all the time and there have been some horrendous accidents caused by them. Not sure why people feel the need to answer mobile phones whilst driving. They seem to be slaves to them. Maybe we should just report them to the police with their number plate every time we see it happening. So glad you're safe, and also the mother & child in front of you. Great post, Jeff. I know you're sad to lose your beloved car, as I would be if it had happened to me, but at least you're alive and well. Get another Saab. 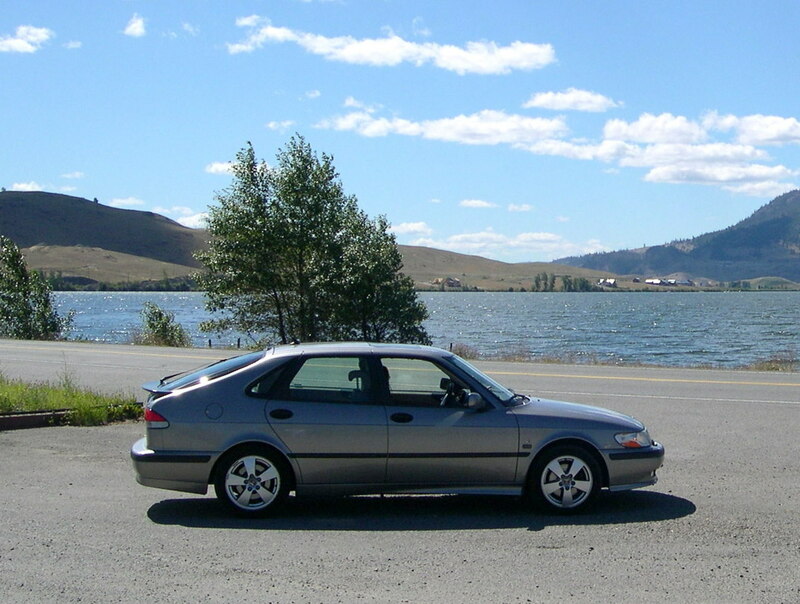 I’m sorry for not responding earlier to your comments and recommendations, but it took me some time to come to grips with the trauma of losing my beloved Saab. The woman who hit me DID have insurance ... but it was apparently not paid up to date. Therefore, her insurance company (which also happens to be mine) had to go after her for money to cover all the fallout from this accident. I did go to see my regular physician on the night after that rear-ender. I had some neck and shoulder pain, and apparently cracked a rib (or else separated the muscle from that rib -- just as painful) in the accident. Fortunately, I seem to be on the mend, but am waiting to find out whether my body delivers any delayed reactions. My recollection is that the cop who showed up on the scene gave the woman who caused all of this havoc a citation for recklessness, but I don’t remember whether it specified her driving while looking at a cell phone. The accident shook me up pretty badly. My memory of all that happened that morning isn’t altogether clear. I would hope that this story would stop anyone else from driving while distracted by a cell phone or other electronic device. However, I think we live in an age when there are all too many distractions, no matter what we’re doing. More such accidents seem inevitable. And I want to pass along my heartfelt thanks to everyone who offered condolences over the loss of my beautiful little Saab. Ronald and Winifred are correct: sometimes you become very attached to an automobile. I loved and babied that car, and I shall never forget its best years or the fact that it saved my life when I needed it most.